A digital multimeter and a loop calibrator in one tool, the Fluke 787 process meter is a useful maintenance and calibration tool. As part of their respected 80 Series of multimeters, which include the much loved 87V model, it has a great build quality and level of reliability. With the 787, you can source and measure milliamp current loops with a high level of accuracy (to 0.05%) and it is an overall great troubleshooting tool. It is a general multimeter with voltage, current and resistance measurement ranges, plus it has several modes, including Fluke’s user-friendly TouchHold feature. You also have auto step / auto ramp output, along with great overload protection. The 787 is essentially the 87V multimeter, with the addition of a reliable loop calibrator. Though you don’t have the full functionality and accuracy of the excellent 87, you get a reliable, all-in-one DMM/loop calibrator, which saves having to use another tool in order to source and measure 20mA current loops – more about monitoring current loops. It boasts a simultaneous milliamp and % of scale readout, coarse and fine 25% manual step, as well as auto step/ramp on milliamp output. Resolution is to 1 micro-amp (µA). The clear screen displays results and output level and is backlit. This is also a True RMS multimeter, so you can measure AC voltage and current from variable speed drives more accurately than you can with standard, average-responding meters – up to 1kHz. 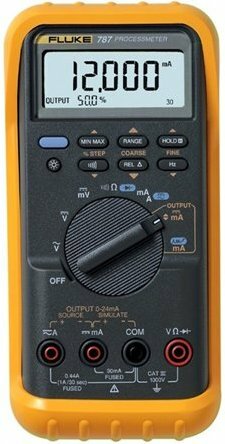 Voltage and current ranges are more limited, though the accuracy level is typically high and reliable as with most other Fluke products. All voltage ranges are separate. There are no full amps and micro-amps ranges, however, so this device is not as useful as the 87V for measuring and diagnosing power circuits and sensitive electronics equipment. The Fluke 787 does have similar functionality and mode settings, though amperage is to a maximum of 1A (for 30 seconds). It can perform as an auto ranging or manual ranging multimeter, with the ability to switch between the two and then select individual ranges. Both are fast, as is the continuity tester, which is especially beneficial when simultaneously testing dozens of cores. The meter comes with the standard TL75 test leads, along with a set of useful alligator clips. There is no temperature scale, however, so no thermocouple. This is an electrician’s multimeter that can be used in light industry, with a rugged build quality courtesy of being made in the USA. It puts up with drops and knocks, with its raised facade protecting the display and dial. Along with being shock and vibration tested, it has drop-test certification to 1m and has a well engineered battery case. The display is backlit and generally has a resolution to 4,000 counts, which increases to 30,000 counts for milliamps. It is smaller than many other multimeters, though numbers and icons are sharp and the refresh rate is around four times per second. In addition, extra functionality is achieved across the function buttons when in milliamp output mode, including step up and down %STEP/COARSE/FINE. *TouchHold: pre-selecting the touch hold function will automatically freeze a stable, higher value when reached. The Fluke 787 uses a 9V battery, which provides around 50 hours of typical usage, or 12 hours when sourcing (at a 12mA reference). The +/- source and simulate milliamp outputs are through the amp and milliamp input jacks (and across the common). The category rating on the 787 is to 1000V CAT-III, which is good for mains installations on the switched side. There is 1000V input overload protection on voltage, resistance and frequency circuits and 150V overload protection on the milliamp input. Amperage inputs are fused to 440mA (HRC type). Fluke has standalone loop calibrators, but you can’t beat the convenience in having it together with a meter. Specifically, in this Fluke 787 review, it is ideal for those into automation and control. It won’t suit those that also work in industry so much – with the lack of high amperage measurement capability – but this is a useful multimeter nonetheless.